Photo was taken at Racine Zoo Beach, just along the water's edge. One of many fabulous Michigan Lake beaches in Racine, WI. This stunning piece was found at 8:37 am on Monday, October 9, 2017. It was the most beautiful morning with clear blue skies and rays of sunlight shimmering on the rock beds that line the beach. Just as my 12-year-old son and I were enjoying our last few moments on the beach, my son looked down and gasped. And that's when I saw it. The red ruby treasure chest piece of beach glass. 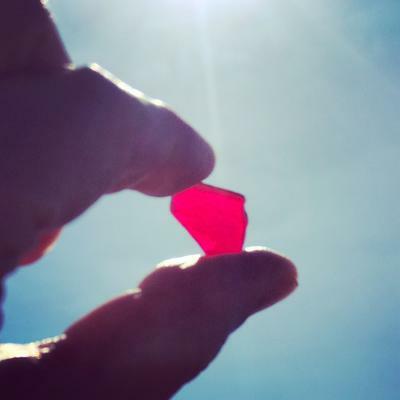 He quickly scooped it up and raised it to the sky...disbelief that we had found a rare red jewel. But it gleamed in the sunlight. And at that very moment we jumped and danced and screamed with joy. Should I live to be 100, I will never forget that moment. This photo will always hold that spirit of joy and excitement for us. Photo was taken with my iPhone 7. Nothing special...just held it up to the light and wanted to capture the gift forever. Our red ruby did all the hard work in making this photo special.